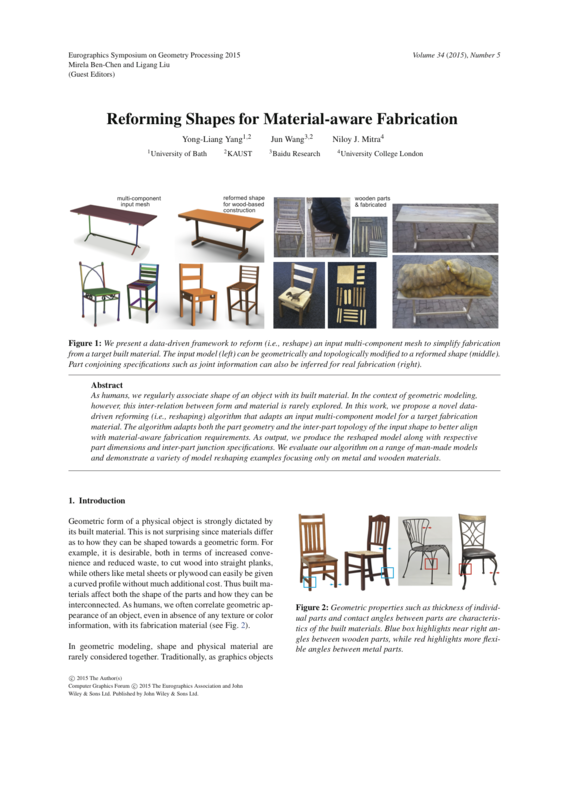 Figure 1:We present a data-driven framework to reform (i.e., reshape) an input multi-component mesh to simplify fabrication from a target built material. The input model (left) can be geometrically and topologically modified to a reformed shape (middle). Part conjoining specifications such as joint information can also be inferred for real fabrication (right). As humans, we regularly associate shape of an object with its built material. In the context of geometric modeling, however, this inter-relation between form and material is rarely explored. In this work, we propose a novel data- driven reforming (i.e., reshaping) algorithm that adapts an input multi-component model for a target fabrication material. The algorithm adapts both the part geometry and the inter-part topology of the input shape to better align with material-aware fabrication requirements. As output, we produce the reshaped model along with respective part dimensions and inter-part junction specifications. We evaluate our algorithm on a range of man-made models and demonstrate a variety of model reshaping examples focusing only on metal and wooden materials. Figure 2: Given an input model (a) and a database consisting of a set of models with labeled part material (b), our system can automatically reform the input model according to user-specified target material (wood in this case) by learning the material- geometry correlation from the database (c). Our system can also optimize the part configuration of the reformed model to facilitate fabrication in the target material context (d). The fabrication specifications (encoded in a fabrication graph, see Fig. 12) of the reformed model can also be inferred from our system (e) to facilitate fabrication (f). Figure 6: Material-aware shape reform on a number of models with target material set to wood and metal, respectively. The fabrication joint inference result is shown next to the reformed model. Ambiguous joints are highlighted by dash lines. 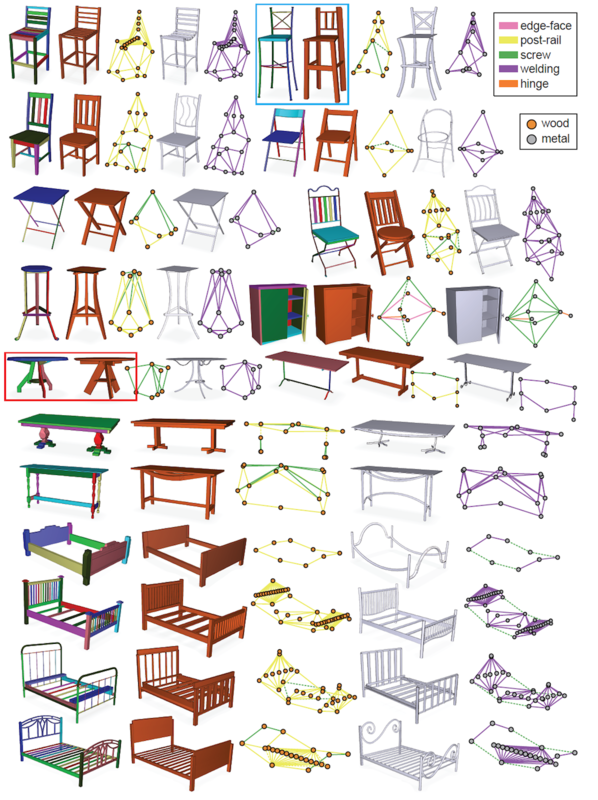 We thank the reviewers for their comments and suggestions for improving the paper; Cristina Amati for help with the chair fabrication. This work was supported in part by University of Bath startup fund BAFS6SYY, KAUST baseline funding, the ERC Starting Grant SmartGeometry (StG-2013-335373), and Marie Curie CIG.